I’ve always felt that service developers and deliverers can be the most creative marketing people in business. As a group, they are remarkably adept at recognizing market needs and creating and launching services to meet those needs. Fortunately for my mother, when I arrived an hour later, all was well. But what if she’d had no nearby family? In fact, today many elderly people live on their own and far from family members and cannot count on friends, who also tend to be elderly, for help in a crisis. Since Janis Carney is an attorney specializing in elder care, she was well aware of this dilemma, which, with an aging population, will only grow greater. In 2013, she created a company, EASE Plan Inc., to provide 24/7 patient advocacy for elderly patients in the ER. Her plan, which for a monthly fee offers Emergency Advocacy Support and Education (EASE) to enrolled members, seems to strike a welcome chord in Santa Clara County (SF Bay Area), where she launched the service. “As a doctor for 20 years, I know how complicated the medical systems has become,” says Dr. H. A. Satri Sukhdeo of the Palo Alto Medical Foundation, in Palo Alto, CA. “Patients can easily get lost in the healthcare system, and [it] is especially dangerous for them when they end up in the ER. These patients need an advocate,” One of every five members of the Boomer generation and almost 1 in 3 of us over the age of 75 will visit a hospital emergency room at least once this year. 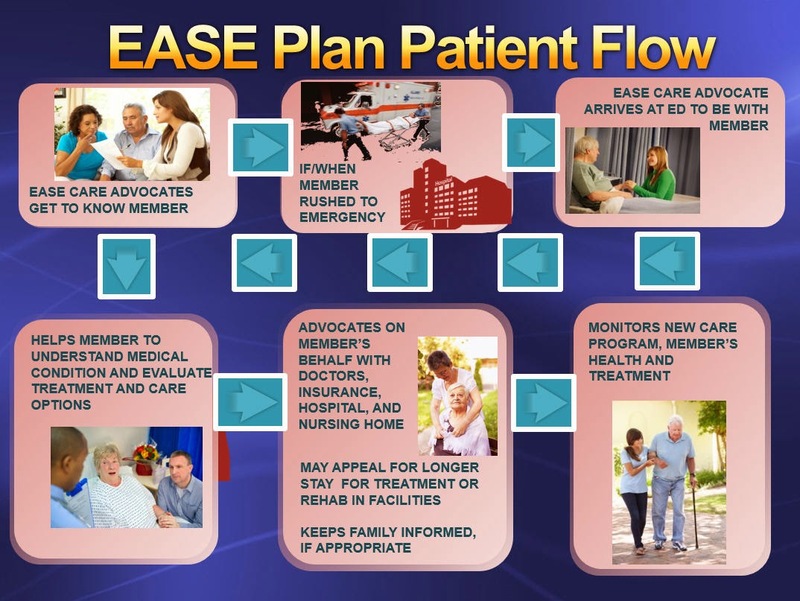 Demand for EASE Plan services seems likely to grow with the shifting demographic. Current clients are finding that Ease Plan offers significant benefits. “I have two grown children, but neither of them could be here in less than 5 hrs. if I had a medical emergency. I felt bad when my own mother had a medical emergency and could not get medical attention quickly. I signed up for Ease Plan as soon as I heard of it,” Said Linda C., Ease Plan client. The service not only supports its clients in the ER but also helps them organize their medical information, be clear on the services to which they are entitled, and, generally, be more effective consumers of healthcare even outside of the ER. “My mother needs 24-hr. care and is in a skilled nursing facility. Unfortunately, I have found that without a professional care advocate, she does not receive all of the care she should be getting. Our [Ease Plan] Care advocate has been a tremendous help to mother and to me,” said Connie F., another Ease Plan member.